But national AFL-CIO president Richard Trumka believes that union and Democratic activists across the state – and the country – will stay energized for both elections. Trumka was in St. Louis this weekend to campaign against Proposition A, which is a right to work law that was passed by the General Assembly in 2017. Under right to work, unions and employers are barred from requiring workers to pay dues or fees. Right to work backers say the law would make Missouri more attractive to business; unions say the law usually ends up with cuts to workers’ wages and benefits. Unions collected enought signatures last summer to force a referendum on the law this year. Trumka said the Missouri fight over Proposition A is attracting national attention. 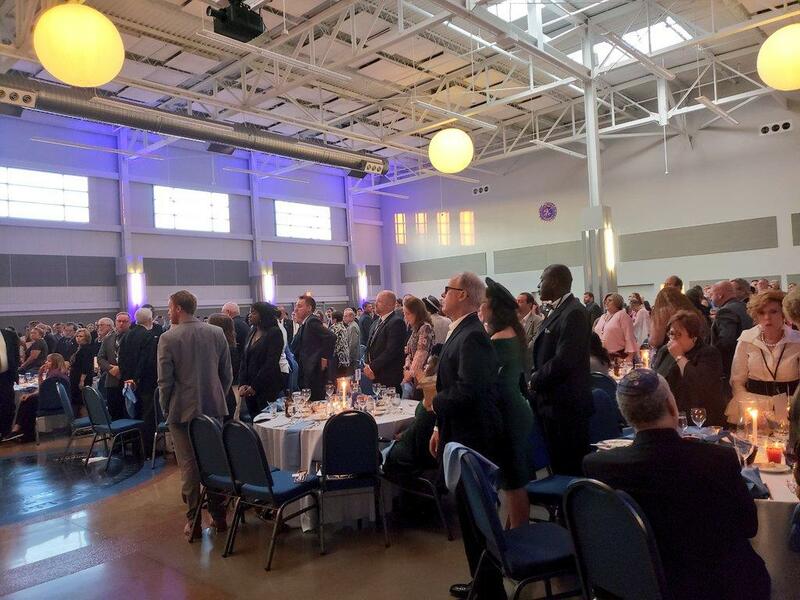 After overseeing a Saturday morning rally, Trumka was among the headliners at the Missouri Democratic Party’s annual Truman Dinner. Held in St. Louis, it's usually the party’s largest event of the year. Former Secretary of State Jason Kander, left, hosts podcast with national AFL-CIO president Richard Trumka. Close to 500 people packed the Sheet Metal Workers' Grand Hall in St. Louis for the dinner. 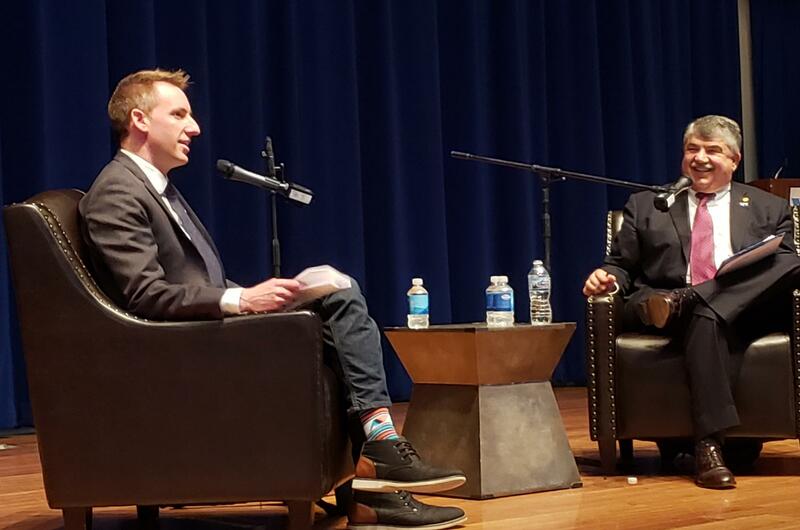 McCaskill and Galloway were among the speakers, but arguably the night’s biggest event was the live taping of a podcast featuring Trumka and hosted by Jason Kander. Kander, Missouri’s former secretary of state, has become a national figure because of a voting rights group he founded, called Let America Vote. Kander also hosts a regular podcast, called Majority 54. Kander – who lost a 2016 campaign for the U.S. Senate and may soon announce a bid for Kansas City mayor – said in an interview that he recorded the Majority 54 podcast on stage with Trumka at the urging of state Democratic Party chairman Stephen Webber. The podcast appeared to be a hit, with most of the crowd sticking in their seats until the end. Among other things, Trumka said that younger Americans are getting a stronger appreciation of unions because they’re seeing how their own working conditions are affected if they’re in a non-union workplace. Trumka said many Americans fail to realize that unions provide more job-training than any other entity in the United States, aside from the military. Before the podcast, McCaskill and Galloway prompted cheers with unusually combative speeches. McCaskill attacked her best-known GOP rival, Missouri Attorney General Josh Hawley, for allegedly failing to work hard at his current job, and mocked him over press reports about his gym workouts and wine purchases. 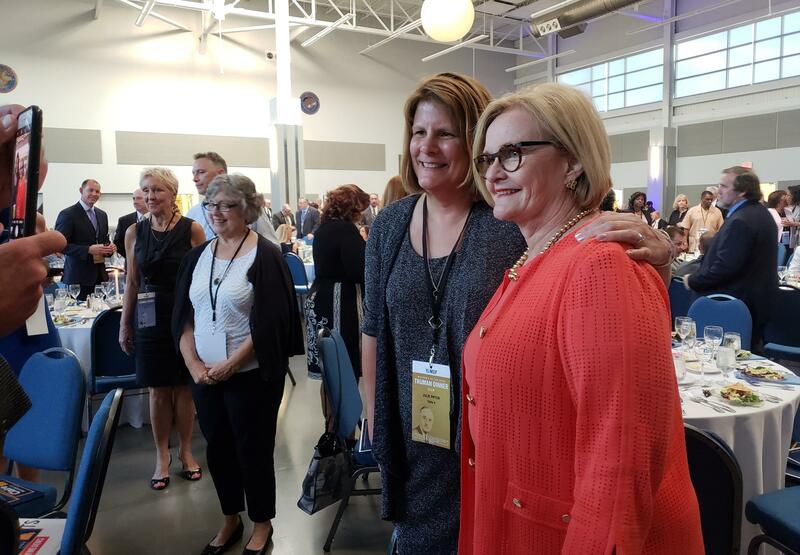 U.S. Sen. Claire McCaskill poses for pictures with supporters at the Truman Dinner. But what really moved the Democratic crowd was when McCaskill launched into her favorite topic: health care. She pointed to Hawley’s support of a lawsuit that would, among other things, eliminate insurance protections for pre-existing conditions. She asked members of the audience to stand up if they or a family member had a pre-exisiting condition. Most did. (Hawley has emphasized recently that he also supports protecting insurance coverage for pre-existing conditions, and faults Congress – and McCaskill — for failing to act). McCaskill left the dinner early, explaining on stage that she was still in pain because she had suffered a cracked rib on Thursday in Washington. Most Truman Dinner attendees stand up when McCaskill asks how many have pre-existing conditions in their family. She said that she had been choking at a caucus luncheon when Sen. Joe Manchin, a Democrat from West Virginia, performed the Heimlich maneuver to dislodge the blockage. He cracked her rib in the process, McCaskill said. She said in an interview that she’s under a doctor’s care. McCaskill joked that she needs to avoid hugs for a while. Galloway told the crowd she feared that the GOP-controlled General Assembly may avoid dealing with the issue that she says was the real legacy of former Gov. Eric Greitens. Greitens had formed several nonprofit groups that could collect unlimited donations from unidentified donors. Galloway asserted that it was the legal threat of having to identify those donors that finally forced him to step down June 1. 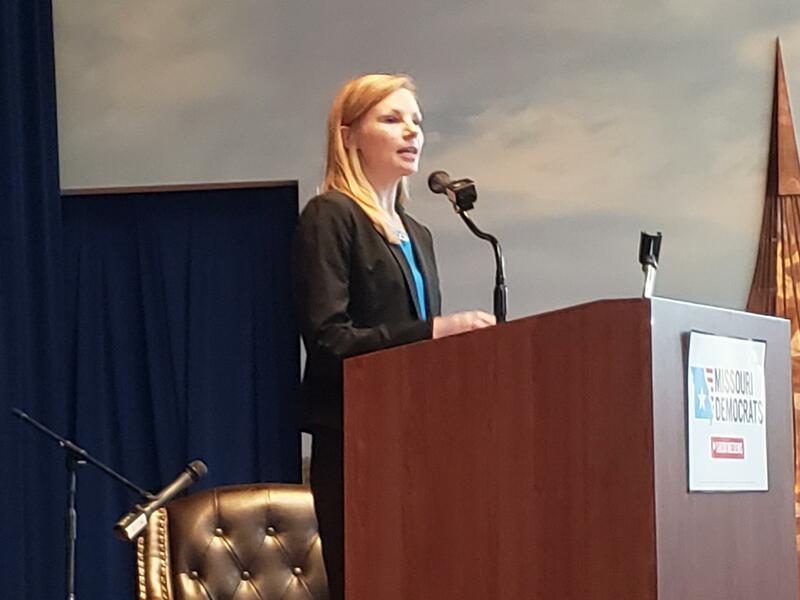 Missouri state Auditor Nicole Galloway addresses fellow Democrats at state party's annual Truman Dinner. The General Assembly needs to pass legislation that requires all groups involved in Missouri campaigns to identify their donors, Galloway said. Galloway said the public will lose faith in government, and democracy, unless the “dark money” is stopped. Follow Jo Mannies on Twitter @jmannies. U.S. Sen. Kamala Harris, a California Democrat and rising national star, delivered a two-pronged address in St. Louis on Thursday that appeared to be aimed at elevating her own profile while also boosting fellow Democratic Sen. Claire McCaskill. Both officials were star attractions at the St. Louis County NAACP annual dinner, held at the downtown Four Seasons Hotel. Many of Harris’ keynote remarks focused on challenges facing like-minded Americans who are upset over various actions by President Donald Trump’s administration. (Updated at 12:30 p.m. April 19 with Hawley's campaign-finance numbers) U.S. Sen. Claire McCaskill has widened her financial lead over her best-known GOP opponent, Missouri Attorney General Josh Hawley, which likely will prompt more allied Republican groups to spend money on his behalf. The Senate candidates’ latest campaign-finance filings, which were due at midnight Sunday, show that McCaskill has just over $11.5 million in the bank. That compares to $2.13 million for Hawley. In both cases, the candidates' totals include aid from other political-party committees, as well as individual donations. Hawley’s money also includes his share of the donations collected during President Donald Trump’s visit to the St. Louis area in March.